Law has always played a significant role in Michael’s life. His father was an attorney and practiced environmental law in Florida. Visiting his dad’s firm growing up, Michael realized early on that he wanted to follow in his father’s footsteps. After graduating Artium Baccalaureus in Political Science from Rollins College in 2006, he began his journey. 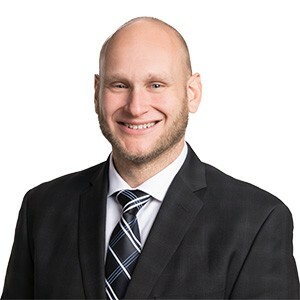 Michael received his Juris Doctorate from Florida A&M University in 2009, and continued on to receive his Master of Laws in Environmental Law from Golden Gate University in 2011. Michael was admitted to practice law in Texas in 2012 and has been at The Gottfried Firm since 2013. His role as an associate attorney allows him to stand shoulder to shoulder in large cases with Mr. Gottfried, as well as independently handle other litigation and transactional matters. Law significantly impacts people’s lives. Michael is diligent and works extremely hard. His immense passion for the law drives his desire to go above and beyond for his clients and contribute to The Gottfried Firm’s growth and practice expansion. His vision is to use his Masters of Laws degree to add an environmental law arm to the firm. Outside of Michael’s work at the firm, he has a strong passion for football. He’s also an avid runner and completed the Austin Marathon in 2014. As his Florida roots and environmental law focus may imply, he loves the outdoors and has even completed survival training in the Florida Everglades. Defends Austin property owners in ADA lawsuits filed by Omar Rosales on behalf of his client Jon R. Deutsch.